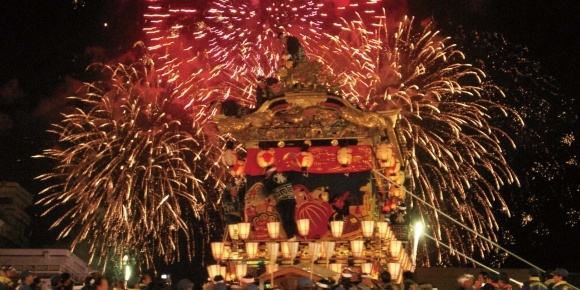 This festival, with a history of over 300 years is designated as part of Japan’s “Important Intangible Folk Cultural Properties”. On the 2nd and 3rd, cars and floats decorated with paper lanterns parade the city. Some of these have performance stages on both ends of the float, on which traditional plays and dances are performed. There is a big fireworks competition at night on the 3rd. The combination of illuminated floats on the ground and fireworks in the evening sky make for an unforgettable experience. (1) Approx. 1 hour from Ueno Sta. to Kumagaya Sta. on the JR Line. From Kumagaya Sta., approx. 1 hour on the Chichibu Railway to Chichibu Sta. (2) Approx. 1h20min from Ikebukuro Sta. to Seibu Chichibu Sta. on the Seibu Ikebukuro Super Express. 15 min by walk from Seibu Chichibu Sta.